This article is intended to guide Google Cloud Platform (GCP) customers in setting up their various GCP resources to avoid common issues and enable best practices for access control and cost management. The guide walks through design decisions and configuration options that help set you up for success in administering your cloud resources. Provide a conceptual overview of the various resources involved with billing. Show you how to set up your Cloud Billing resources efficiently and for ease of management, to align your strategic priorities with cloud usage and maintain a well-functioning account. Help you avoid the most common billing-related issues faced by GCP customers. Teach you about best practices when configuring resource access permissions to ensure redundancy and security. Provide step-by-step instructions to help you set up your financial governance tools for greater clarity, accountability, and control. If you are an enterprise developer already familiar with Google Cloud Platform and the services it offers, and are looking for guidance in launching your application, see the launch checklist documentation and best practices for enterprise organizations. If you are just starting out with GCP and want to experiment with Cloud products and services, or create a proof of concept, see the Google Cloud Platform overview or start a free trial. This guide is organized into two main sections. 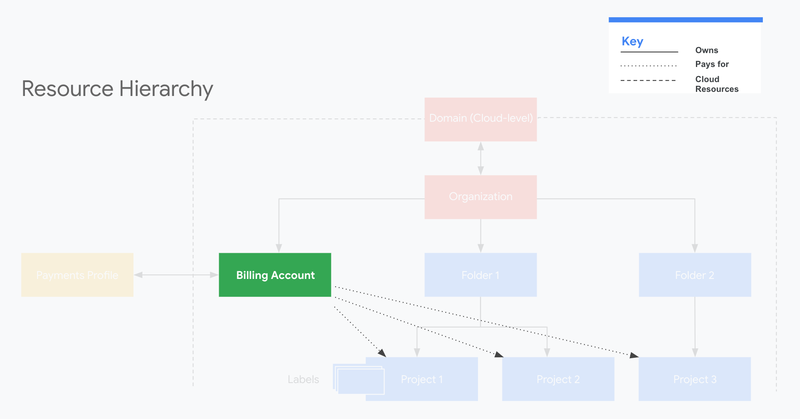 The first section provides you with a conceptual overview of the various resources and roles involved with managing GCP billing. The second section walks you through the steps necessary to configure your GCP resources optimized for your billing needs. 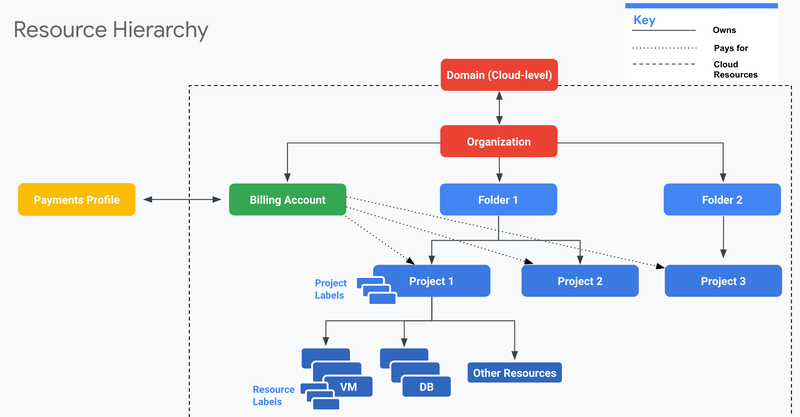 Resource Overview and Hierarchy: A high level visual representation of the various GCP resources that impact your billing and how they relate to one another. Roles Overview: A summary of the access roles organized by resource, that are directly relevant to your billing set up. A step-by-step configuration walkthrough covering GCP onboarding topics relevant to your billing setup, including guidance for customization based on your organization's needs. Before working through the setup guide section, familiarize yourself with these concepts. Understanding the key concepts will help you with configuration decisions for your cloud environment. If you need additional information, see the overview of Cloud Billing concepts. Resource management is focused on how you should configure and grant access to the various Cloud resources for your company/team, specifically the setup and organization of the account-level resources that sit above the service-level resources. Account-level resources are the resources involved in setting up and administering your GCP account. This article provides prescriptive advice on configuring your account-level resources and the roles necessary to manage them in order to maintain a well-functioning account. GCP resources are organized hierarchically. 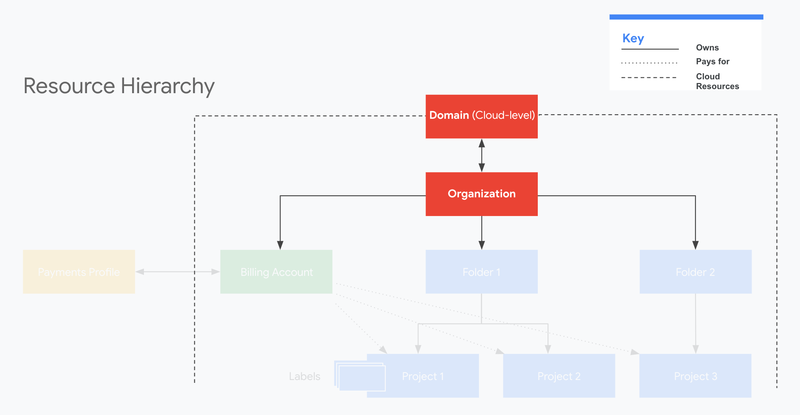 This hierarchy allows you to map your organization's operational structure to GCP, and to manage access control and permissions for groups of related resources. The following diagram shows an example resource hierarchy illustrating the core account-level resources involved in administering your GCP account. The public domain is the mechanism to manage the users in your organization and is directly related to the organization resource. The domain organization resource represents an entire organization (for example, a company) and is the top-level node of the hierarchy. The organization resource provides central visibility and control over all GCP resources further down in the hierarchy. Next in the hierarchy are folder folders. You can use folders to isolate requirements for different departments and teams in the parent organization. You can similarly use folders to separate production resources from development resources. At the bottom of the hierarchy are projects. Projects contain the service-level resources (such as computing, storage, and networking resources) that process your workloads and constitute your apps. Resources can be further categorized using label labels. You can label the service-level resources (for example, VMs and DBs), as well as your account-level resources (for example, projects and folders). monetization_on Cloud Billing accounts are linked to and pay for projects. Cloud Billing accounts are connected to a payment Google Payments Profile. The payments profile is a Google-level resource and you pay for Google services (such as AdWords and Google Cloud) using the payment methods that are attached to that profile. You can enforce granular permissions at different levels in the resource hierarchy to ensure that the right individuals have the correct access and permissions within your organization. The structure you define is flexible and allows you to adapt to evolving requirements. If you are just beginning your GCP journey, adopt the simplest structure that satisfies your initial requirements. See the Resource Manager overview for full details. You can set a Cloud IAM policy (roles) at the organization level, the folder level, the project level, or (in some cases) on the service-level resource. Resources inherit the policies of the parent node. If you set a policy at the Organization level, it is inherited by all its child folders and projects. If you set a policy at the project level, it is inherited by all its child resources. Each section in the setup guide provides information about decision points, offers best-practice recommendations, describes important roles, and provides a configuration checklist. Information about potential issues is also provided, with the ultimate goal of helping you configure your GCP resources optimized for your billing needs. The guidelines help to ensure your setup is best protected against the most common access and billing issues faced by GCP customers. Before working through the setup guide, familiarize yourself with the Cloud Billing concepts. Understanding the key concepts will help you with configuration decisions for your cloud environment. There are a variety of different ways that you can organize your resources and set up access controls with Google Cloud Platform. When making these design decisions, it's important to understand how your choices can impact your ability to effectively manage costs (for example, showback, chargeback, and cost analysis.) During this webinar, we'll discuss important design decisions, configuration options, and best practices, showing customer examples to help you avoid some of the most common pitfalls that customers face related to billing and cost management. The domain and organization sit at the top of the resource hierarchy. Together, the Cloud domain and organization allow you to centrally administer all of your users and Cloud resources. The Domain allows you to manage the users in your organization. The Organization allows you to manage your GCP resources and which users have what type of access to those resources. Your company Domain is the primary identity of your organization and establishes your company's identity with Google services, including Google Cloud Platform. The Domain is linked to either a G Suite or Cloud Identity account. Identity is used for authentication and access management of your users to GCP resources. When first starting out with Google Cloud Platform, it is important to decide how you want to manage your user authentication and identity. We offer flexible ways to manage access with G Suite and Cloud Identity. For user authentication and identity, should you use Cloud Identity or G Suite? The Organization resource is closely associated with a G Suite or Cloud Identity account. You acquire an Organization resource only if you are also a G Suite or Cloud Identity customer. Each G Suite or Cloud Identity account may have exactly one Organization provisioned with it. 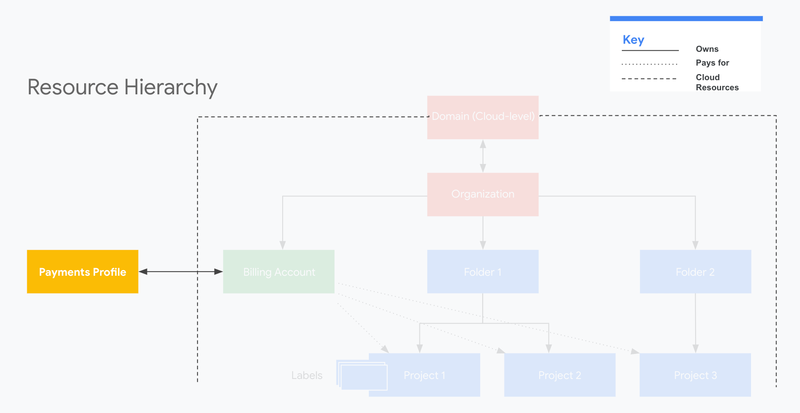 Once an Organization resource is created for a domain, all GCP projects created by members of the account domain will, by default, belong to the Organization resource. Google Cloud Platform uses Google Accounts for authentication and access management. Google recommends using fully managed corporate Google accounts for increased visibility, auditing, and control over access to Google Cloud Platform resources. Cloud Identity provides free, managed Google Accounts you can use with Google services including Google Cloud Platform. Using Cloud Identity accounts for each of your users, you can manage all users across your entire domain from the Google Admin console. Use case: You do not need G Suite features like Drive or Gmail and only need the account management features offered by integrating your domain. Recommend: Obtain an Organization for free by using Cloud Identity. If you're a G Suite administrator, you can manage all of your users and settings through the G Suite Admin Console. By default, all new users are assigned a G Suite license. If you have a subset of developers who don't require G Suite licenses, you can add Cloud Identity accounts instead. Use case: You want to take advantage of G Suite features like Drive or Gmail in addition to the account management features of G Suite. Recommend: Obtain an Organization by signing up for G Suite. For more information, see Getting an Organization resource and Get started with Cloud Identity. ❑ star Choose Cloud Identity or G Suite. Review the Cloud Identity Overview and get started at the Cloud Identity Signup page. Follow the Signup Process to manage the Cloud Identity account. Tip: Use your own work email to begin the signup, but in the last step, use an admin email account which you can access (for example, admin@yourdomain.com). Make sure that the admin@yourdomain.com account has an email address that can receive mail, because Cloud Identity will use that address to communicate with the Admin. Follow the domain verification process. We also have a video walkthrough. Disable Automatic G Suite licensing. Regarding Domain Issues: If, during signup, you encounter an error message when attempting to use your domain, visit the domain troubleshooter. ❑ Review our best practices for adding/syncing users and groups. ❑ Add users and groups via the admin console, via Google Cloud Directory Sync, or via the Admin SDK API. For non-G Suite customers: Users using their @yourdomain.com email as a Google Account to use Docs, Sheets and other G Suite products as consumers will lose access to those services (even Viewing mode). Please review the article Add users who have existing Google accounts. ❑ Set up more than one Super Admin and ensure other project owners, administrators, and employees know who they are, so they can reach out in case of account access issues or if there is a need to delegate another Organization Admin. NOTE: At some point, most customers are affected by loss of access to resources in GCP. Ensure you are not unintentionally locked out of your GCP resources by having redundant administrators, multiple Organization Admins, and more than one Super Admin. ❑ Check the number of licenses provided. By default, Google provides a fixed number of free-of-charge licenses. If you need additional licenses, contact us. ❑ Cloud Identity provides a diverse set of security and user management features. For a list of what is included, see the features and editions comparison chart. An Organization is the root node of the Google Cloud Platform hierarchy of resources. An Organization is associated with exactly one Domain. All resources that belong to an Organization are grouped under the Organization node, which provides insight into and access control over every resource in the Organization. GCP users are not required to have an Organization resource. However, if you need to manage more than one user account, we strongly recommend configuring an Organization. The Organization resource provides many benefits, including: Cloud IAM policy inheritance and resource access recovery. For more information, see Creating and Managing Organizations. ❑ Obtain an Organization resource. If you followed the steps for Domain and Identity, you already have an organization. ❑ Set up multiple Organization Administrators who will be responsible for defining Cloud IAM policies and delegating responsibility for resources throughout your organization, like Cloud Billing and Project management. Tip: By default, the email account designated as the Admin in the sign up process for Cloud Identity (usually admin@yourdomain.com) will be assigned as the first Organization Administrator. If you set up invoiced billing, the Technical Contact on the invoiced billing agreement will be delegated as the Organization Administrator. ❑ Grant Cloud IAM roles at the Organization level that you want everyone to use, while keeping in mind the security principle of least privilege. Tip: To ensure that Cloud Billing Accounts are only created by users that should handle payment information, settings, and cost attribution for the organization, minimize the number of users that are granted the role of Billing Account Creator. We recommend removing the Billing Account Creator role from the Organization level. ❑ Migrate your Projects and Billing Accounts into your Organization. Tip: For larger-scale migration, we recommend using the Organization Setup Wizard. Have an Organization Admin enumerate all of your projects and billing accounts that need to be migrated along with a list of their owners for use in the Setup Wizard. Once migrated, if an owner of a project or billing account loses access to their account or leaves the company, ownership of the project or billing account can be recovered by the Organization Admin. Billing accounts pay for projects. A project and its service-level resources are always paid for by a single billing account. A billing account operates in a single currency and is linked to a Google payments profile. A billing account can be linked to one or more projects. Project usage is charged to the linked billing account. Projects that are not linked to a billing account cannot use GCP services that aren't free. stars Key Decision: One Billing Account or Multiple Billing Accounts? We recommend the creation of one central Cloud Billing account that lives in your Organization. For most customers, adding additional billing accounts creates unneeded extra overhead, making them more difficult to track and manage. And multiple billing accounts might not behave in the way you expect with Committed Use Discounts or might cause issues with any promotional credits. You need to split charges for legal or accounting reasons. You need to pay in multiple currencies. stars Key Decision: Pay with Credit / Debit Card or Use Invoiced Billing? When you first set up a Cloud Billing account using the Google Cloud Platform Console, by default, you are creating a self-serve billing account, connected to a credit or debit card as the payment instrument. If you have a dedicated Finance/Accounting team, or if you anticipate a large amount of spend when you first start on GCP, you may be better off using invoiced billing. To learn if your organization is eligible for invoiced billing, contact Cloud Billing Support. You must be a billing administrator of your organization's current billing account to apply. This role is typically filled by someone with financial control at your company, for example, a business lead that owns the P&L or a technical team member with budget management responsibility. Important, this role is required in order to contact Billing Support. This role is usually issued broadly in concert with the Project Creator role. Trusted Project Creators in your organization typically need this role so they can link their projects to a billing account. TIP: Want to control who can view costs? Different roles applied at different levels contain permissions that allow access to view costs. For example, if you want a user to be able to view costs for an entire billing account, including all of its projects, set the billing.accounts.getSpendingInformation permission on the billing account level. The following predefined roles grant this permission by default: Billing Account Administrator and Billing Account User. If you want to limit a user to viewing only the costs for a specific project, give the user the billing.resourceCosts.get permission on the project. The following predefined roles grant this permission by default: Project Owner, Project Editor, and Project Viewer. For more information, see Overview of Billing Access Control and Custom Roles for Billing. ❑ star Create or Identify your main Billing Account that you want to use. If you have an invoiced account, this step is already done for you. ❑ Grant access to view Billing Reports to people in finance and other departments and roles where users need to track spend or need to review cost anomalies. ❑ Assign multiple Billing Account Administrators to each Billing Account – you might also consider using Organization-level permissions. Tip: The Billing Account Administrator is an owner role for a billing account, and can be set on the Billing Account or on the Organization level. Billing Account Administrators can manage payment instruments, configure billing exports, view cost information, link and unlink projects and manage other user roles on the billing account. ❑ star Consolidate multiple Billing Accounts into your main Billing Account(s). First identify your main Billing Account(s) and the projects you want link to those billing accounts. Learn how to view projects linked to a billing account. Link or move existing projects onto your main Billing Account(s). Tip: If you have many projects to move, try our gcloud tool to link projects to a billing account. ❑ star Settle and close any other billing accounts that you no longer intend to use to avoid potential issues in the future. View your old Billing Accounts to verify that they no longer have any linked projects. After moving all your projects onto your main Billing Account(s), wait two days for the charges to stop on your old Billing Accounts. After two days, settle any existing balances on the old billing accounts, and then close the old Billing Accounts. ❑ attach_money Establish a good understanding of billing and cost attribution best practices. Set up budget alerts with multiple alert thresholds to reduce spending surprises and unexpected cost overruns. Tip: To set a budget alert, you must be a billing administrator. Export billing data to BigQuery (recommended). Export billing data to a CSV or JSON file (captures a smaller dataset). Tip: Data is available in your dataset only from the time export is enabled. For cost management purposes, we recommend enabling Billing Export on your Billing Account(s) early on, when you are just beginning to attach Projects to Billing Accounts. This way, your usage data will be tracked and available to you from day one, and ready for analysis using a variety of tools. Your usage is reported from your Projects to your Billing Accounts and your usage data is made available to you in a variety of ways, all of which can be used to help you understand the full picture of your spend. Your invoice tells you what you owe. Billing reports tell you why and where your costs came from. Recommendation: To answer cost questions, look at billing reports first. Billing Export outputs your daily usage estimates to a dataset or file you specify. You can use it to run analysis on your usage data. Billing Export to BigQuery includes an invoice.month field so you can match your exported data to your invoices. It is possible that late-reported usage may cause your data to not map directly to your invoice; that is, some product usage at the very end of a month may be charged to the next month’s invoice. Note that exported billing data does not include any tax accrued or credits issued to a billing account. Tip: Use Data Studio to visualize your spend over time. Billing Reports uses the same data that Billing Export uses, and displays an interactive chart that plots usage costs for all projects linked to a billing account. Use billing reports to get an at-a-glance overview of your usage costs and discover and analyze trends. You access billing reports in the Google Cloud Platform Console. If you have multiple billing accounts, the billing report displays usage costs for one billing account at a time, not aggregated across all billing accounts. Depending on your level of access, your view of usage costs may be limited to viewing the costs of certain projects, rather than all of the projects linked to a billing account. Invoices represent the canonical amount you are billed for each month and provide an exact breakdown of what usage you were billed for. Review your invoice PDF or CSV line items each month and review the payments center for credit memos and invoice payments history. Your business is represented by a Google Payments Profile, and you pay for Google services using the payment methods that are attached to that profile. The payments profile is a Google-level resource managed at payments.google.com and is linked to a Cloud Billing account. warning IMPORTANT: The payments profile is NOT a Google Cloud Platform resource. It is managed with separate roles/permissions and is not governed by your Cloud organization; your Cloud IAM roles do not apply. For Payments Profiles, you can add and remove users or change permissions in the Google Payments Center. stars Key Decision: Use One or Multiple Payments Profiles? Similar to billing accounts, for administrative purposes, fewer payments profiles are generally recommended. For most customers, creating additional payments profiles adds more overhead and exposure to potential issues. You want separate personal and business profiles tied to your Google Account. You want to manage profiles for more than one business or organization. Your Cloud Billing accounts need to be linked to the appropriate Google Payments Profile. See the other Google services associated with the payments profile. Appropriate access for users who just need to receive email notifications (for iInvoices). Important: Your Payments Profile contains important billing information but it is administered outside of your Organization hierarchy. Ensure its information is regularly reviewed and up to date by setting up more than one Payments Profile Administrator who should handle this information. We recommend tasking an administrator to make regular reviews of your Profile’s information. ❑ star Create a Business Payments Profile for use with GCP. If you have an Invoiced Billing Account created for you, this step is already done for you. If you are setting up a Billing Account online, creating a Payments Profile is part of that process. Tip: When creating a billing account, you will be given the option to select an existing Payments Account or create a new one. To simplify the management of this account, whenever possible, we recommend reusing your existing business profile instead of creating a new one. ❑ Assign more than one Payments Profile Administrator to be in charge of editing information like addresses, payment methods, tax information, and other account settings. be aware of this scope of access when reviewing invoices or account alerts to ensure they apply to the correct product (for example, an account alert might be triggered by Google Adwords but does not apply to GCP). Important: To ensure users can receive monthly invoices and important communications about Payments Profile issues, new Payments profile users and administrators will need to verify their email. ❑ For invoiced billing, assign multiple invoice delivery addresses, both for email delivery and for paper invoice delivery, to ensure that you are always aware of when a new invoice has been sent out. ❑ For electronic notifications and monthly statements, add users and set their email preferences to receive documents and notices. ❑ Regularly review the information on your payments profile to ensure it is up to date, especially physical and email addresses, payments users, and payment instruments. Warning: Out of date information can lead to missed notifications, lost access, or missed payments. payment Add a backup payment method as a safety net, in case the primary method is declined. Regularly review your cost and payment history. Each month, review your invoice carefully, and look for anomalies and unexpected changes. Regularly check for any unapplied credits and payments to ensure that your monthly payments and credits are correctly applied to your invoices. For help, reach out to our collections team to apply any unmatched credits you might have. Projects, folders, and labels help you create logical groupings of resources that support your management and cost attribution requirements. used to form the basis for enabling services, APIs, and Cloud IAM permissions. mapped under an Organization node (so you must have an Organization node to use folders). great for cost tracking at a granular-level; they are forwarded to the billing system so you can analyze your charges by label. Projects are required. Folders are optional, but recommended. Why use projects? Projects are the basic organizing entity in GCP. Projects are required to use service-level resources, such as Compute Engine and Cloud Storage. Service-level resources inherit project settings and permissions. You may need to create multiple projects, depending on the number of products or services you are running on GCP. You'll want to define a meaningful naming strategy for your projects so you can easily identify them. For more details about projects, see Creating and Managing Projects. Why use folders? Folders group projects, centrally applying consistent policies and permissions across them. You may want to group your resources together logically using folders, depending on the number of people and teams you have who will be using GCP, and the number of products and services you'll be running on GCP. For example, you could set up separate folders for development, staging, and production projects for a service. Or, you might choose to spread the projects and services across folders that reflect different environments. You could use folders to organize your projects by departments within your company. One benefit of using folders is you can enforce different Cloud IAM policies on each folder. For more details about using folders, see Creating and Managing Folders. Why use labels? Labels annotate resources within and across projects. Depending on your cost tracking requirements, you might want to apply labels to resources to identify them by what they are, what they do, or what team they are related to. For example, you might label all of your Compute Engine instances that are HTTP servers, or label all of the components that are related to your database service. For more details about using labels, see Creating and Managing Labels. ❑ star Create Projects to group resources together that share a common goal, theme, or purpose. If a product or service needs to use multiple GCP resources, like Compute and Storage, use Projects to group them together. Project Creators in your organization should be assigned the Billing Account User role on your Organization’s Billing Account so that they can link projects to a Billing Account. All active Projects should have a linked Billing Account. ❑ star Name Projects meaningfully. Decide on a strategy for naming your projects. For example, you could name your project to reflect the service and the collection of resources it contains, such as productname-prod. The project name is a human-readable way to identify your projects. The project ID is generated from the project name you enter when you create the project in the GCP Console. ❑ Set up folders to mirror the way you work in your organization and on your infrastructure. ❑ Use Folders to silo Cloud IAM permissions per team, products, services, or environments. ❑ Set project-level Cloud IAM permissions as needed (if you are not using folders or need another level of granularity). ❑ star Place a lien on critical projects. To prevent projects from being accidentally deleted, add protections against project deletion with liens. You can place a lien upon a project to block the project's deletion until you remove the lien. This can be useful to protect projects of particular importance. ❑ attach_money Use Labels to further categorize your resources. You can use labels to tag resources cross-Project and cross-Folder. Each resource can be tagged with multiple labels. Information about labels is forwarded to the billing system and picked up in Billing Export so they are useful in cost reporting and analysis. attach_money Tip: Labels and Project Names are key in cost management. The names propagate to Billing Export and can be used to answer questions like "How much am I spending on databases?" and "What projects are costing me the most this month?" ❑ Decide whether or not you’ll be purchasing Committed Use Discounts (CUDs) for your Projects and understand how Sustained Use Discounts (SUDs) apply to your Compute Engine resources and bills. ❑ If needed, review how quotas work and request a quota increase. ❑ If needed, enable APIs for your projects. Enabling an API associates it with the current project, adds monitoring pages, and enables billing for that API if billing is enabled for the project. To maximize the move to cloud, organizations need a clear understanding of their cloud costs. During this webinar, we’ll share best practices for how to get started with managing your GCP costs and usage. We’ll demo how to set up billing accounts, organizations, projects, basic permissions, and budgets. We’ll also introduce Billing reports to help you understand your current cost trends and forecast your spend at month-end so that you can prevent budget overruns. How much do all of my frontend servers cost? How many resources are used in my staging environment? How do I understand and optimize my spending across departments? 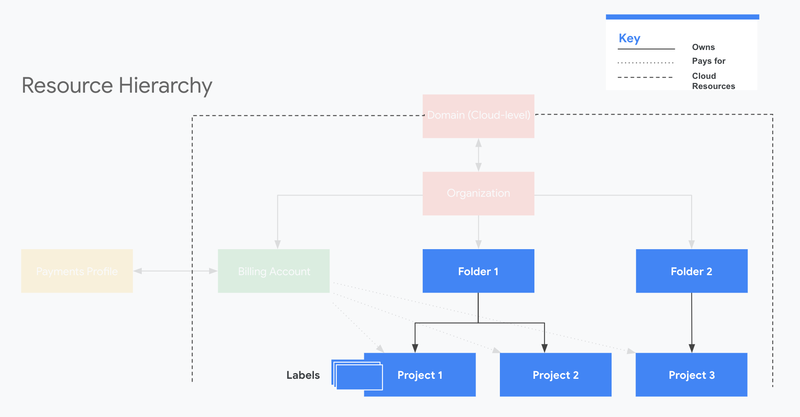 GCP tools such as organizations, folders, projects, and labels help you create logical groupings of resources that support your management and cost attribution requirements at scale. In this session, we will show you how to use these tools to take control of your costs, whether you’re a solo developer or a multinational corporation. With businesses increasingly making the shift from on-premises to cloud, it’s more important than ever to put financial governance policies in place to control cloud costs. During this session, we’ll cover how financial governance controls; quotas, permissions, and budgets help prevent unexpected cost overruns. In addition, the Broad Institute will demo how to use programmatic notifications to take automated actions to control and cap your cloud usage and costs. Many large organizations build custom dashboards and reporting around their cloud usage to track that usage across teams and applications, and to understand cost drivers. In this session, the Billing team and Vendasta will show you how to export your detailed billing data to BigQuery, write useful queries around that data, and create custom dashboards based on those queries in Data Studio. Managing your GCP usage and cost trends can be easier than you think. In this session, we’ll help you understand how to view graphs of your GCP costs, set up custom reports and budgets, forecast your end-of-month-bill and set up alerts if you are likely to exceed your budget. In the time since Next '17's "Saving Money on Compute Engine," a lot has changed, but customers like you are still looking to control costs and get the most capability out of every cloud dollar. In this talk, we'll review all the latest products and techniques for optimizing your usage to get the most compute for the lowest bill.